We’d love your help. 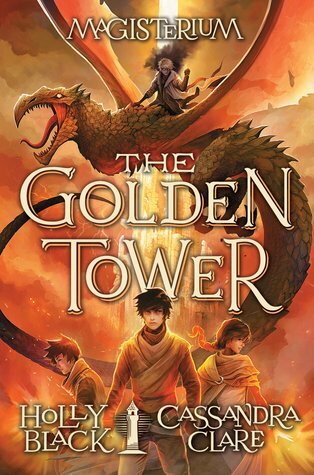 Let us know what’s wrong with this preview of The Golden Tower by Holly Black. The excitement and magic continue in book five of Magisterium. To ask other readers questions about The Golden Tower, please sign up. why has it had ratings and it hasnt even been written? Gameknight_99903 People liked the series, so they believe that this book will be a good one. Even as an adult, I'll still be plagued by waiting for yet another Cassandra Clare book. This was a pretty satisfying conclusion but also a little underwhelming. I enjoyed reading it, but it definitely wasn't my favourite in the series. Sad to say goodbye to these characters though! I'm giving this a full 5-star review before it even came out. . . . Cassie, Holly, it better be the best book I will ever touch, understood? Un final a la altura. Desde el primer libro vi a esta saga con potencial. Los primeros dos libros quizá pecaron de introductorios, de inocentes. Con el tercero se vio un cambio a cosas más oscuras, y el cuarto y quinto creo que han conseguido trabajar muy bien los personajes y la trama más política. En La torre de oro nos enfrentamos al final de la saga Magisterium. Después de casi 5 años siguiendo esta saga he decir que no estoy nada decepcionado. Creo que es un muy buen trabajo en equipo, y Holl Un final a la altura. En La torre de oro nos enfrentamos al final de la saga Magisterium. Después de casi 5 años siguiendo esta saga he decir que no estoy nada decepcionado. Creo que es un muy buen trabajo en equipo, y Holly y Cassie han conseguido crear un nuevo mundo con un montón de matices. Hay armas secretas en este libro. No solo a nivel de guerra y criaturas, sino a nivel de trama. Me han sorprendido para bien los ases en la manga que se tenían guardados para el final. Hay plot twists increíbles que me rompieron el corazón y otros que me hicieron chillar. Es un final bueno para una pentalogía aparentemente sencilla, pero que consigue convertirse en algo más con el paso de las entregas. De hecho, a nivel de personajes, este libro es muy diferente al primero. La evolución de los protagonistas, sus dilemas y miedos son una aventura, llena de matices, debates y más miedos aún. No sé, me ha gustado mucho. Eso sí, he de advertir que el final me da a mí que no es tan final... No me extrañaría encontrarme una saga spin-off o continuación de esta dentro de unos años. Tiempo al tiempo. Bookmark me. This series started out pretty mediocre, but I saw potential, so I continued to read it. At first I thought it would pay off, because I genuinely enjoyed the second and third book... but then The Silver Mask happened, which felt like the authors just wanted to be done with it and wrap the story up. There was still a little bit of potential left for this one, so I was crossing my fingers while simultaneously lowering my expectations. And I was still let down. Look, the world building in t Yeah, no. Look, the world building in this was always shoddy and the plots nothing to write home about, but I thought the characters were charming (okay, mostly Aaron) and some of the humor was genuinly funny (ok, mostly Jasper). But this time, even the characters felt oddly empty and one note. With added teenage angst about "Omg does she really like meeeeeee???" in the middle of some half-assed mission. So, yes. I'm grumpy. I know both authors of this series are controversal and not for everyone (I actually agree with a lot of the criticisms, but manage to enjoy most of their books anyways for various reasons), but I know that both of them can do better than this. It was lackluster. It really did not help that my favorite character was sidelined to a freaking voice in Cal's head, who got to reassure him from time to time and give him tips about how to talk to people/girls without offending them. Yay. (view spoiler)[Cal/Tamara never had any chemistry ever. Both had more with Aaron. Heck, AND Jasper! It felt forced in the last book and it feels forced now. Basically this reads like some magical AU fanfic where someone didn't bother about worldbuilding and some flimsy plot is just there, because they want the character to drive around, order very specific food, talk to each other and say some quippy one-liners the author is very proud of. How does this have a 4.33 rating when it probably won't be out until 2018? I had such high hopes for this book after the redeeming of the series (for me) in book 4. Just in general, there was so much potential for this series, and I had such expectations both from books 1 and 2 and from Clare’s and Black’s prior works. Now, I get this is a middle grade series. It won’t be as deep as Black’s The Cruel Prince/Tithe/etc. or Clare’s The Infernal Devices/The Dark Artifices/etc. I also get that these books are not necessarily aimed towards me, and both the humor and plot are aimed for those younger than I. However, this series, this book, being a part of a younger genre does not excuse some of the issues this series had, especially in terms of pacing, plot, and characters. It does not excuse the illogical nature of some of the decisions in this book, or the lack of effort (it seems) in the planning of this book, and series as a whole. I was honestly surprised when it seemed as if this book left things purposely open for a sequel series, as it honestly felt, while reading, that the author duo seemed to be less and less interested in these books. You can possibly blame my earlier love for the series on my younger age, but I’d argue that those books were just overall better, in terms of character dynamics, plot, and pacing (oh god, especially the pacing). Yes the trio and world heavily mimicked Harry Potter, and the series definitely needed to move away from that, but that doesn’t mean that the series needed to lose the normal pacing it had in books 1 and 2. And yes, the plot was not complex at all in the earlier books, but it doesn’t need to be, as that’s not necessarily what I expect from a middle grade book. Let’s just get the worst over with and discuss pacing. In books 1 and 2 this was fairly well done, with the books spanning an entire school year, and sometimes a bit of the summer beforehand. A standard pacing style for a school based series. Book 3 already broke this pattern by ending about half way through the year (if I remember correctly, it’s been a few years now), and that sharp contrast in time period definitely left the book feeling unfinished. The time period of book 4 is honestly a mystery to me, but at the start of book 5, 4 years of schooling have supposedly passed (I don’t know how). Book 5, while when looked at logically, takes place over a few months or something, reads like it all takes place within the first week of school or something. There is almost no build up or problem solving in this book. Nothing stalls the constant moving plot, and this constant action, combined with weird time jumps/lack of focus on anything but events that directly solve the plot, makes the book read really quickly, as well as feel weirdly timed. I’d have to actually study this book to figure out how the timeline all works together, and even then I can’t promise I’d find an answer. Additionally, the allocation of pages to different periods of time didn’t add up at all. There are a few moments of travelling and driving in this book, but the pacing and logistics of them is so ridiculous that I couldn’t even fully take those seriously and as a part of the actual plot/story. It honestly just felt like badly written filler, even when it contributed directly to the plot. As I’m already on the subject, let’s talk about the plot. Arguably, the second worst part of this book next to the pacing. There is no true conflict in this book. Nothing goes wrong, nothing is lost, and anytime something gets in the way of Call/Tamara/Aaron, even the main evil of the book, almost no effort goes to actually solving the problem, as a solution is almost always presented immediately. Additionally, this lack of struggle means the entire book reads at the exact same amount of tension. There are no highs and lows. It is all action, and since there are no dull moments to make that action exciting by comparison, the action itself becomes boring. Additionally, there is almost no build up to this installment. Book 4 seemed to neatly wrap up everything in a bow for our duo/trio, so this book definitely needed something to bring that evil back to the forefront, some whispers of dark magic or evil returning rather than just a single hint and then sudden entrance of the big bad. The characters themselves were also just weaker than in past installments. Call’s main focus was staring at Tamara and worrying about college, admittedly mundane worries for someone with an evil soul who also happens to be harboring the spirit of his dead best friend inside of him. Call ended up being such a let down that I won’t even spend more words on him. Additionally, what the heck was this villain? He was ridiculous to the point of absurdity, and nothing close to the level of evil the past books seemed to contain. I mean, Alex freaking killed someone for their powers, and you can’t even meet that level for your finale? Come on guys. I almost never say this, but this but this series should have been shorter. This series would have actually been stronger if things had just ended on book 4. I can’t say much good about this particular book, but at least it was a quick read. Rowling is finally releasing a book about Voldemort! Finally done with this series! Honestly, I'm a bit disappointed. The whole series seems so rushed. There could have been a lot more world-building for a five-book series. The main characters are somewhat good, a bit shabby, not too great. They are a bit mediocre for me. And the main villain was too petty! A villain who demands all that he wants, may it be a girl, a tower with a TV room and a villain who just wants to sit on his throne just to spite his enemies and do nothing. It gets a bit boring Finally done with this series! Honestly, I'm a bit disappointed. The whole series seems so rushed. There could have been a lot more world-building for a five-book series. The main characters are somewhat good, a bit shabby, not too great. They are a bit mediocre for me. And the main villain was too petty! A villain who demands all that he wants, may it be a girl, a tower with a TV room and a villain who just wants to sit on his throne just to spite his enemies and do nothing. It gets a bit boring. This should probably be a 4 star book but 6th-grade-Sage is making me give it that extra star. The title of this book has changed so many times I don't even know what to call it anymore. Holly and Cassandra, you are extremely talented. You two are now my favorite authors and you are the authors of my favorite series and favorite book. Yes, it did go really fast, but that really fit in with the plot because the plot speeds as fast as a bullet. You two did amazingly in making sure the writing doesn't slow this plot down. es ist vorbei, es ist geschafft. Die Geschichte rund um Callum Hunt und seinen Freunden hat ein Ende gefunden. Alles insgesamt eine tolle Reihe mit einer spannenden Idee und vielen guten Überraschungen. Ich habe meine Zeit gern mit den Protagonisten verbracht, lediglich ein paar ständig aufkommende Wiederholungen gingen mir auf den Wecker. Letztendlich bin ich trotzdem ein wenig traurig, dass es nun vorbei ist. Wie bei den meisten guten Reihen. Where do I even start with this book? The first issue is that it was paced at the speed of light. Omg, it was so rushed so that nothing seemed to feel important. The second thing is the addition of another character that felt forced and unnecessary. It bad enough that Jasper, even after 5 books, felt like he didn't belong and unnecessarily forced into every scene that he is, so the fact that the new unnecessary character was his love interest made it worse! The next was the new "twists". I will a Where do I even start with this book? The first issue is that it was paced at the speed of light. Omg, it was so rushed so that nothing seemed to feel important. The second thing is the addition of another character that felt forced and unnecessary. It bad enough that Jasper, even after 5 books, felt like he didn't belong and unnecessarily forced into every scene that he is, so the fact that the new unnecessary character was his love interest made it worse! Digno final de la serie sobre los alumnos de una escuela de magia. Se la ha comparado con la serie de Harry Potter, aunque creo que se han de ver desde otro punto de vista. En mi opinión, la de Harry es mucho mejor, porque profundiza mucho más en todos los personajes; mientras que Magisterium me ha recordado más la típica serie de internados de mi infancia, pero con la magia entre medio; donde los protagonistas son siempre los mismos, con muchos secundarios poco definidos. Pese a lo anterior, he d Digno final de la serie sobre los alumnos de una escuela de magia. Huh, well, I actually saw a couple of people who said that this book was the weakest in the whole series, but I think that while it wasn’t the best out of all of them (the 4th book is still my favorite), it wasn’t the weakest either. Also, the whole “confronting & defeating the villain” part was a bit short, so it wasn’t the best I’ve ever seen, but there were books were it was much worse and less climatic so that part was about 3,5/5 stars. Would I read more books from these authors? In term of CC, I’ve read most of her books already (:D)& in terms of HB, I read a couple of her books, and they were pretty good, so highly likely. That ending was so completely Holly and Cassie that I actually hate it. These authors will be the death of me. This series is definitely not targeted toward me anymore, but hey, I enjoyed the ride anyway. It helps that these books were very quick reads. I definitely think they could have been shorter, but I guess I understand what they were going for with the titles and all. A robust and fun ending to a series I’ve followed since the very beginning. A worthy farewell for these characters and this world. Twists and turns are abundant! AAAA THIS WAS TOO SHORT. I absolutely loved the ending, everything turned out beautiful. My favorite thing about the book though, was the dialogue between Call and Aaron in Call's mind, it was a cool concept, kinda like in The Host. Das war ein wirklich gelungener letzter Band! Es ist unglaublich viel passiert und ans Licht gekommen, sodass es an keiner Stelle langweilig war. Wie bei den Bänden zuvor, ging es mir fast schon wieder zu schnell. Für 5 Sterne hätte ich mir etwas mehr Tiefe gewünscht. Vor allem was das Chracter-Building und die Beziehungen untereinander betrifft. Ich hätte über die ein oder andere Nebenfigur echt gerne mehr erfahren. El final de Magisterium ha sido, como todo apuntaba, una historia llena de aventuras, ritmo trepidante y personajes geniales que lo dan todo por aquellos a los que quieren; magia, villanos y reflexiones preciosas en La torre de oro para cerrar de una forma genial la saga. Such an amazing conclusion to an epic series! This trio will stay in my heart the same way the HP trio has. All of the characters are so well done. I loved them all, even the villains. The magic was unique and added so much adventure to the story. I laughed, I cried, and I wanted to throw this book at one point....totally an epic read!